Welcome to the 7th episode of The Author Hangout, a “Hangout on Air” designed to help authors, especially self-published and indie authors, with marketing their books and improving their author platform. Authors struggle with various aspects of marketing and we are here to help! We have talked about email marketing and building an email list in almost every episode, because it really is that important to successful, long-term book marketing. Now, we’ll devote an entire episode to helping you FINALLY learn how to set up an e-mail list and how to use it effectively. 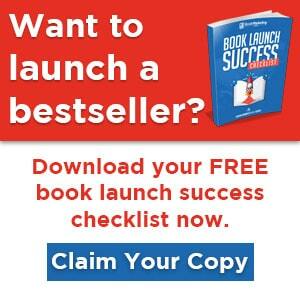 Learn about setting up a mailing list and how to use it to sell more books! We were joined by award-winning author Randy Ingermanson. 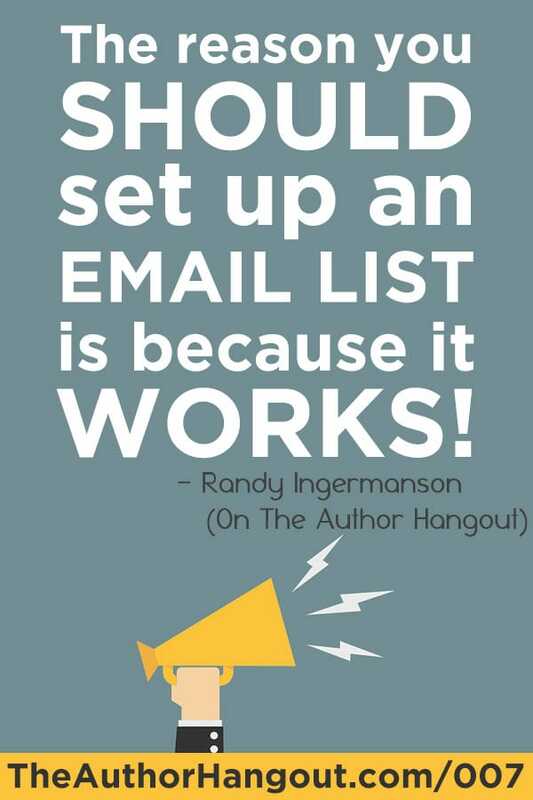 He wrote the book on writing fiction, and he has built mailing lists both as a fiction and nonfiction author, so no matter what genre you’re writing in, he has some great tips and knowledge about building an e-mail list. What does it mean to be a strategic author? He then discusses how to actually solve each of those problems, in order, as well as the distinct phases of marketing. Watch this part of the video because this is probably the most important part of understanding book marketing and the rest of the ideas in this show. Who can convince me to start doing email marketing? While your book may not necessarily have the same sales percentages as this blogging product, the overwhelming power of using email marketing is the key takeaway! Even if the numbers were halved, that would still be 43% of his sales coming from email marketing. If you properly build a list and use it to engage with your readers, and to sell when the time is right, an email list will definitely out-do any other marketing efforts! Still don’t believe us? 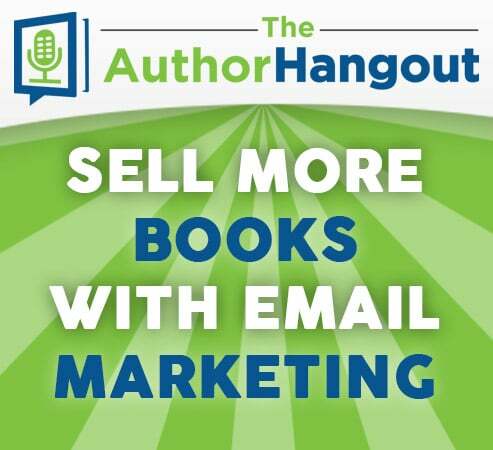 See Tim Grahl’s quote in this episode of The Author Hangout about how much better email converts for authors than other sources many authors spend their time on. Where do we find that initial audience? Since an email list works so good at converting people, how do we get people onto our mailing list? No matter what you use, it is a specific tactic. Randy then explains how to put these tactics together to attract, engage, and convert people to create your “marketing machine”. See the video or listen to the podcast to learn more about this concept. Can I put something in my book to attract people to my mailing list? Since we can’t get a list of buyers from Amazon or Smashwords, one of the better ways to get people onto your mailing list is to use the back of your book. If someone makes it to the back of your book, they are going to go somewhere. You should direct them where to go. Randy also goes into the 2 other very important things he includes in the back of his book as well, so be sure to watch the video so you don’t miss out on those! Will building an e-mail list be an overnight success? This is a key… he was already hanging out with and engaging with his audience. He was sharing information, being helpful. Then, when he launched his mailing list, people WANTED to give him their email, because they knew he could provide them value. Are you currently engaging with potential readers? Where do people who read your genre hang out online? Where do people who are interested in your nonfiction topic hang out? Begin engaging with them there. You aren’t try to sell to them where you are engaging with them.. you are just engaging with them and getting them to know who you are so they become interested in you. To learn more about this topic of finding your readers online, watch Episode 3 of The Author Hangout, “How To Find Your Readers”. What do you put in your mailing list emails? Randy wasn’t asked this directly, but he wanted to make sure readers knew what to put in your mailing list emails. What does that mean for you? Can you offer short stories to your readers for free to get them engaged? One popular tactic that some fiction authors use is to write a short story of the back story of their main character. Maybe a scene from their past or something. 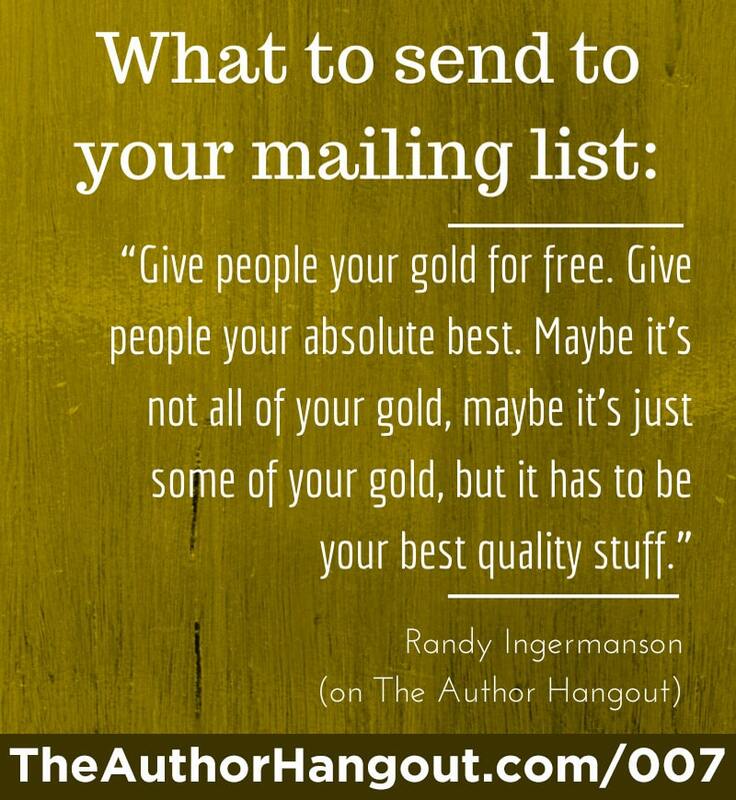 Offering this for free is a great way to hook your readers and to get them on your mailing list. Then, you can provide other short stories, excerpts, art from your books, and more to keep them engaged. That way, when you do try to sell your next book to them, they are excited. What email service do you recommend? If you are interested in signing up for Mail Chimp, you can do that here. They offer a free plan which is great for authors just getting started. You won’t start paying unless you want premium features (which are nice but you don’t need to start out), and until you have a certain number of subscribers. Another option is Aweber. They have been one of the industry leaders for a long time. Click here to learn more about Aweber. What is the psychology of giving something away for free? If you’re giving them this great content in your e-mail list, why shouldn’t you sell it? Giving stuff away free in your email list is a great way to get people onto your mailing list. Giving your book away for free, either the first in a series on a permanent basis or a short term free book promo, is another way to get people to read you. Then, some will join the mailing list, and you will be able to sell more books to them later because they now like and trust you, because they were able to learn more about you from your free giveaway. Our eBook Submission Tool allows you to submit to 30+ free ebook sites in a matter of minutes, to help make your free promo a success! Learn more about that tool here. Right here… You can watch the video above or listen to the audio version as well!